A perfect location for a chilled out and laid-back holiday, Corallia Beach Hotel Apartments is located in Coral Bay, a beautiful coastal location a new mile north of central Paphos. 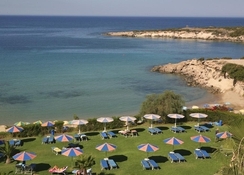 It is just a short way from Paphos International Airport at 25k with the beachfront running along right outside of it. Dine in or choose from one of the superb restaurants or bars around Coral Bay that cater to an array of global tastes in addition to traditional Greek and Cypriot food. 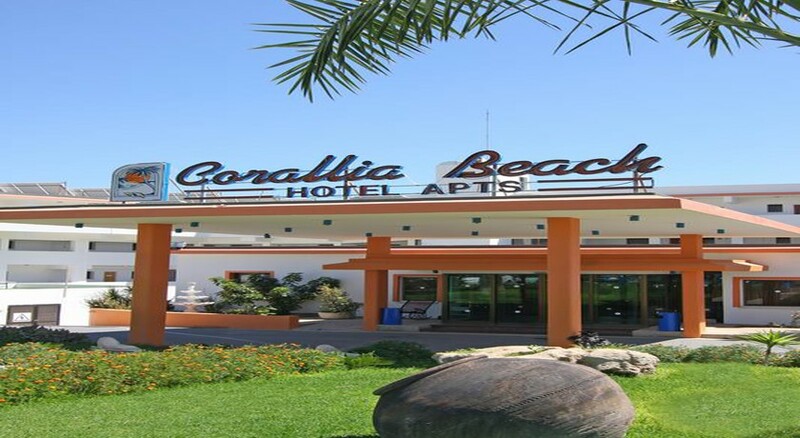 At stay at Corallia Beach, Hotel Apartments will be comfortable and convenient with all the facilities you’ll need for a great stay. You’ll find well-appointed rooms with stylish décor kitted out with amenities such as air-conditioning, tea and coffee making facilities and a private balcony or terrace and a fully-equipped kitchenette for dining in. 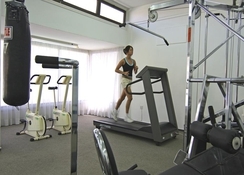 The hotel has a swimming pool and gym as well as a playground for children and provides access to massage, sauna, tennis court and a bowling green for a local fee. Alternatively, take a short car journey south into central Paphos where you’ll find museums, water parks and historic sites or north to the rugged coast and Paphos Zoo. 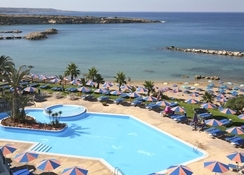 Corallia Beach Hotel Apartments is located just 25km from Paphos International Airport. Though in Paphos, it is situated outside of the main hub of the city centre providing a more relaxed and relatively quiet location. It can be found right on the beachfront, so guests have easy and instant access to the beach. There are several restaurants close to the hotel and easily walkable, however, the main collection of restaurants can be found further south along Coral Bay Avenue, less than a mile away. Guests will also find souvenir shops and a supermarket for food shopping. Ithaki Amusement Park is less than two miles away and can be reached in five minutes by car. You’ll find rooms with tastefully decorated interiors that maximise the space and the admit plenty of the Cypriot sun with large sliding doors that open on a private balcony or terrace. These rooms come equipped essentials including air-conditioning, T.V., tea and coffee making facilities, safe deposit box, private bathroom and much more. The apartments feature a fully-equipped kitchenette for preparing food and dining. Most rooms sleep up to four guests with many offering attractive views from the balcony or terrace looking out over the Mediterranean Sea. The main on-site restaurant serves breakfast and dinner with local Greek and Cypriot dishes on offer in addition to international flavours. Enjoy your meal with entertainment with a weekly Cypriot/Greek Night that brings a little local and traditional flair to proceedings with traditional dancing and live music. Dining out affords guests a fantastic selection of restaurants to choose from such as Arpis Coral Bay restaurant which combines great food with great views over the sea. Nearby, you will also find global tastes that include, Chinese, Japanese, Italian, fresh seafood options and traditional tavernas. If your looking for value for money then look no further this is great hotel if you just want a week away relaxing in the sun. 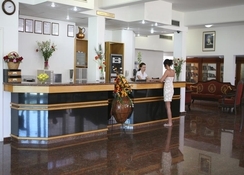 Staff were lovely and hotel is very well kept. It’s location is second to none with it being right on the beach front and the beach and sea are lovely on this part of the coast. Breakfast is also another good bargain with 5 Euro for all you can eat. My only gripe would be the rooms were basic and by the end of the week I could not wait to get back to my own bed and comfy mattress.